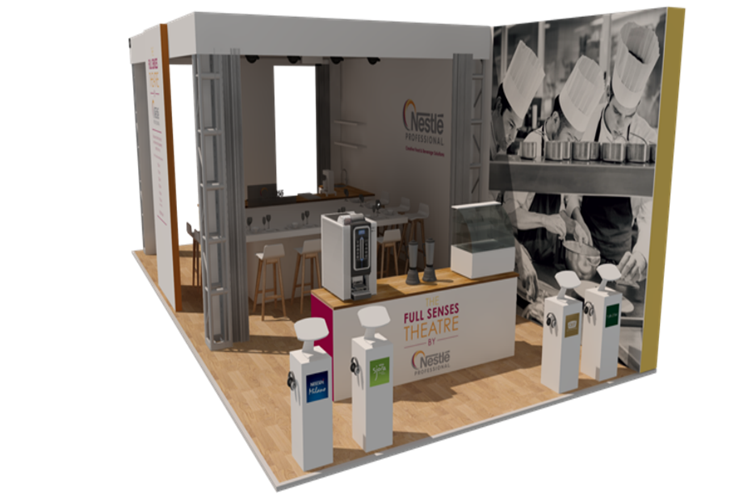 Nestle Professional (NP) has devised the Full Senses Theatre, an immersive dining experience to be showcased at the Restaurant Show next week. The trade show is taking place at Olympia from today (3 October) until 5 October. Visitors will be invited to register for sessions on the day, which take place inside a curtain-enclosed dining area. Once seated and the curtains closed, all diners will be treated to a five course mini-tasting menu that showcases dishes using the NP brands and ingredients. All dishes will be prepared and finished inside the dining area, with a chef making use of a fully equipped kitchen area. When the dishes are brought to table, the experience will beign, with projection videos 'filling' the table and accompanying sounds playing in tandem, including the sounds of the sea and visuals of a crab for the crab starter. After the sessions end, the curtains will be drawn back to give the stand the chance to refresh and also to direct diners towards the always-open part of the experience. This area will feature machines/food items that can deliver samples, as well as iPads and brochures with further information for attendees. The activation is being implemented by agency Tribe Experiential. Four brands of NP will be used in the experience, including CHEF, Milano, Sjora and ready-made desserts such as Aero & After Eight cheesecakes. The Dining Club by Ikea, an immmersive experience located in Shoreditch in London, celebrated the joy of cooking together. French gourmet mustard brand Maille hosted an alfresco Paris-themed dining event over the summer.